GetDivorcePapers.com provides professionally completed, 100% court-approval, money-back guaranteed Connecticut divorce forms. Just create an account, complete the interview, and file for divorce. Our case managers do all the work for you, and send the completed Connecticut divorce forms when they are ready to be filed. It is essential for the filer of the case to be resident in Connecticut. But, final decision will only be made when one of the spouses would be resident here for one year. In cases which involve the decision of spousal support, it is necessary to submit the paper in plaintiff's county. For all other divorce cases, papers can be submitted into the either of counties where spouses reside. Irrecoverable breakage to the marriage. Incompatibility and willful separation for one and half year. Conviction to crime and jail. Absence for seven years without any sort of communication. Any cause of dissolution of marriage if it is related to the child's best interest. Age of the child and his/her will if he or she is capable of making sound decisions. No specific guidelines have been mentioned in the statute of Connecticut. Only the joint custody is emphasized on and is considered best for the childcare. Any separate income of child. Age and health of parents. Employment and earning capability of each parent. Employment chances for the child in future. 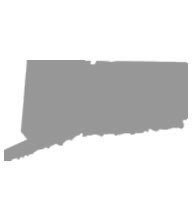 Connecticut has formulated official guidelines for the child support that are utilized for the amount estimation of this support. However, if the amount comes out to be unjust for any spouse, then the figures can be reassessed to get to a reasonable amount. Contribution made by each spouse towards the acquisition of property. Education and vocations possessed by both spouses. Cause of dissolution of marriage. Connecticut is an equitable distribution state and it also considers the separate properties of spouses as well as their gifts and inheritances. Reasons for the dissolution of marriage including the faults of both spouses. Time period that the marriage survived for. Skills and employment chances for spouse that is seeking for support. Court takes 90 days in declaring the final decision to the spouse. Meanwhile it allows mediation for both of spouses if it feels any chances for the reconciliation. Further, spouses can also make request for the mediation. In case of property distribution and child custody, court may assign an arbitrator for the process of counseling. There is no need of a lawyer when applying for divorce in the state of Connecticut. A divorce case which is filed without any help of an attorney in any of the states is known as Pro Se Divorce. Literally, Pro Se is a Latin phrase and it means "on her or his own". Process of getting the divorce without the help of lawyer may vary from one State to another. These types of divorces are perfectly legal and enforceable in Connecticut, and are actually very convenient. Usually, once settlements have been made regarding property distribution and custody matters among the spouses in case of a mutual divorce, Pro Se Divorces are filed.